The GCTV Video Contest (“Contest”) is open to all Guilford residents who are students enrolled in 9th through 12th grades at a public, private, parochial, or home schooled at the time of entry and when prizes are awarded. To register your video or for questions please email GCTV Contest. Please review the contest rules carefully for video submission guidelines and the submission and judging process. You may enter up to two videos. A completed registration packet must be completed for each video submitted. You can download a PDF or Microsoft Word version of the registration packet. Just because you can download an image, video or audio from the internet does not mean it is OK to use in your video production. Royalty free content is stock media created for the purpose of being able to use it in your project. A one time, up front cost to purchase such media allows you to use it in your projects, LEGALLY, and without having to incur additional charges in the future (royalties). Below is a list of links to well-known royalty free content sites. If you are using a site such as Flickr or Creative Commons be sure to read the permissions for each piece of content carefully. Artists have complete control over how their content is used and not everyone who submits content to these sites permits it to be used in projects. 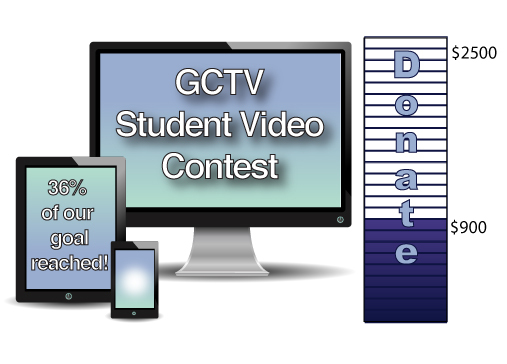 The deadline to submit videos to the Student Video Contest has been extended to Tuesday, April 30, 2019. We are at the 36% mark of our $2,500 goal. Every little bit helps. See below for details on how you can support the Scholarship Fund for the 2019 Student Video Contest. GCTV needs your help to launch our 4th Annual Student Video Contest, offering local young people the opportunity to showcase their media talents. Like before, the contest will be open to Guilford students who are in grades 9-12. They do not need to be attending GHS – all high school age Guilford residents are welcome to participate. This year, GCTV is seeking community support for the contest. The producers of the top three videos are awarded a scholarship, which in years past has been funded by anonymous donors. This year’s funding goal is $2500. It is our hope that with community support we can increase the amount of scholarship money offered in this year’s contest from $1000 - $2000 and have some funds to rollover into the next year’s contest scholarship. Please consider contributing to the Student Video Contest Scholarship fund. If GCTV is fortunate enough to exceed our funding goal of $2500 for this year all remaining funds will be carried over into the next year’s contest. If we meet our current bench mark of $1000 but do not reach the $2000 needed to double our scholarship then funds in excess of $1000 will carry over into next year’s contest. Please review our sponsorship levels. All contributions are appreciated and will be acknowledged as outlined below for the 2019 Student Video Contest. Website and Facebook mentions with company logo. Logo in the credits of the award ceremony video. Verbal mention at the beginning of the Awards ceremony video. GCTV bulletin board acknowledgment on GCTV Public. Channel with logo; website, phone number. Acknowledgement in credits of student video contest ceremony video(No logo). Community Sponsor – Donate what you wish. This option is for those who wish to support the contest but would prefer to not be recognized by name. We will acknowledge the group of “Community Sponsors” on the website and Facebook page and credits of the student video contest ceremony. Click for more info on this year's winners.